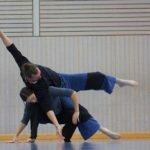 Contact Improvisation is a partner dance, usually done in duets (but sometimes alone or in larger groups). You use rolling, sliding, pushing and pulling to keep a constant point of contact with your partner. In this workshop we will learn the fundamentals of this dance form. You can expect to practice weight sharing, partner exercises, hands on explorations of anatomy and improvisation in physical contact.